To be honest, I have never been so meticulous since I became a mom. As most parents would readily agree with me, we always strive to give the best if not the bestest for our children. I know, there ain't such a word but you get the drift. When you become a parent, you start to frantically examine every single food that goes into your kids' mouth and every single thing that they use from toys, strollers, baby cot, baby wipes, clothes and yes, even bath soaps and shampoo! I know it sounds crazy but that's reality in the world of parents. Whenever I am presented with something mild/safe/chemical-free anything, I go "YES, PLEASE! Give it to me baby!" Haha! Speaking of which, when a friend asked me if I wanted to review a liquid soap that is mild/safe/chemical-free, obviously I didn't hesitate to say yes right away. Like I said earlier, I am into anything that is produced without chemicals. Dr Bronner's started sourcing certified organic ingredients for their products in 2000 out of a desire to support sustainable agriculture without synthetic chemical fertilizers and pesticides. Castile soap is made of vegetable oil and NOT from animal fats or synthetic detergents. Dr Bronner's Castile Liquid Soaps are made using pure coconut, olive, hemp and jojoba oils. It cleans effectively, yet gently which makes it perfect for kids and adults with sensitive skin. Dr Bronner's Castile Liquid Soaps can be used in many different ways. It's an all-in-one soap for your household. For moms like me, it can be used as all-purpose cleaning spray, fruit and veggie wash, reusable kitchen wipes, facial cleanser, floor cleaner, dish washing soap, hand and body wash and antibacterial cleanser. For kids, it is basically used as mild body wash. For dads, it can be used as a shaving cream, ant spray and dog shampoo (most dads do the dirty job, don't they?). "How is that even possible? ", you may ask. You can read about it here. We are currently using Dr Bronner's Citrus and Lavender Pure-Castile Liquid Soaps and I can't tell you enough how it smells so heavenly! I specifically and personally chose those two variants because my boy loves orange and whenever he bathes with the citrus variant, he goes "Mom, I love it! It smells just like my smiley orange!" 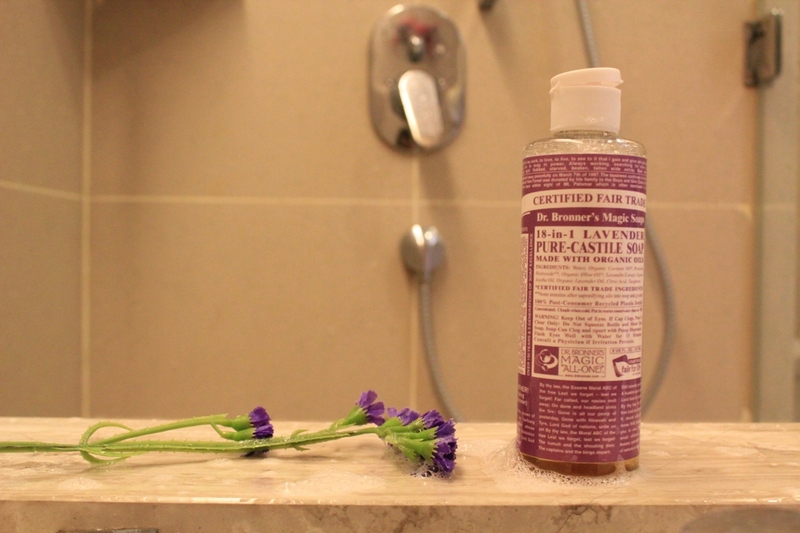 We use Dr Bronner's Citrus Pure-Castile Liquid Soap in the morning to wake up our senses and freshen our body and mind. We use lavender when we shower at night before retiring to bed to help us sleep soundly and peacefully. Yes, the aroma does help! We are totally sold with it. I even went to the extent of bringing it on our recent trip to Puteri Harbour because G loves it so much. As you can see from the picture, G's bathtime also means playtime. 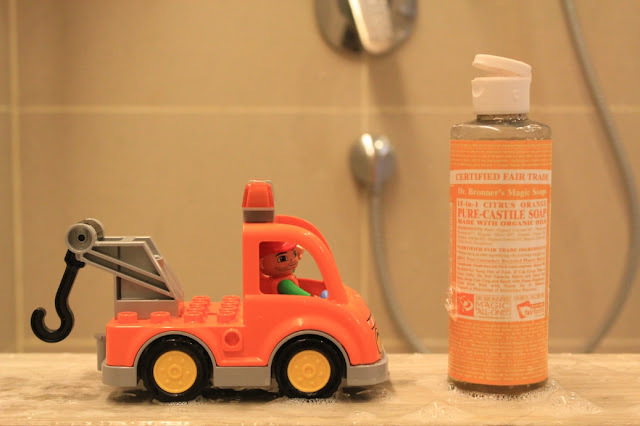 Now his bath-slash-play time is made even more special and precious with his favourite liquid soap that smells so good! Five generations, over 150 years of soapmaking excellence. Is there any other brand that can beat that? Born in 1908 to a Jewish family that had been making soap since 1858 (yes, 1858, not 1958! ), Emanuel Bronner was the third generation certified as a master soap maker under the guild system of the time. The 4th and 5th generations of the Bronner family who run the company today continue to make Dr Bronner's unsurpassed soaps with care and integrity. Ten years ago, Dr Bronner's commited to sourcing their major raw materials from certified Fair Trade and organic projects around the world that ensures fair prices, living wages and community benefits for farmers, workers and their families. It simply means that when you purchase any Dr Bronner's product, you are actually supporting more just and vibrant producer communities around the world. Verdict: I highly recommend Dr Bronner's Castile Liquid Soaps that are available at Nature's Glory. If you can find any other soap as mild, safe, and versatile as Dr Bronner's, please leave me a comment below. I am keen to try it for comparison.